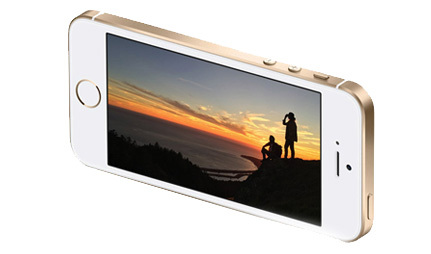 iPhone SE takes the best features of iPhone 6S, and presents them in a pocket-friendly 4 inch design. 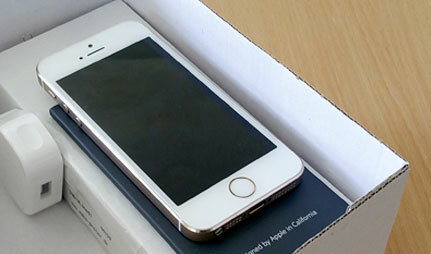 With power to spare, this stunning handset is the perfect way to enjoy iPhone on a budget. £658.99 total cost over 2 years What's This? £663.99 total cost over 2 years What's This? £686.99 total cost over 2 years What's This? £700.99 total cost over 2 years What's This? £705.99 total cost over 2 years What's This? £738.99 total cost over 2 years What's This? Introducing Apple iPhone SE, a new 4-inch smartphone with a sleek design packed with impressive features. Running on the latest iOS 9.3 and featuring a 12-megapixel iSight camera, iPhone SE is a great choice if you don’t want to spend over the odds but still want ingenious performance. 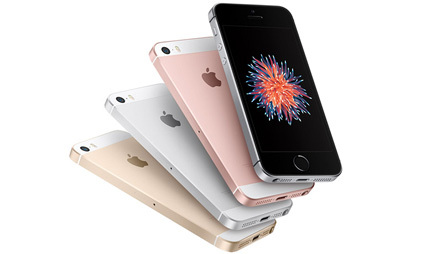 Order your iPhone SE from Mobiles.co.uk, available on all major networks on a range of tariffs. 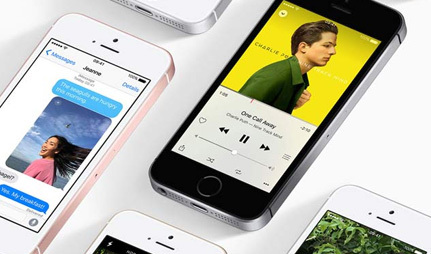 The iPhone SE comes with the iPhone 6S and 6S Plus's 64-bit A9 processor and M9 motion coprocessor. This means the SE is capable of gaming console–class graphics performance that makes games and other apps much richer and more immersive. Running on iOS 9.3, the iPhone SE adds numerous innovations making your smartphone experience more seamless. There’s new features such as Night Shift, which automatically shifts the colours in your display depending on the time of day. Additionally, regular apps such as News, Notes and Health have been improved. Arriving with a 12 megapixel iSight camera with 4K video recording, the iPhone SE doesn’t mess about when it comes to photography. Apples GIF-style Live Photos feature is also supported. There's even an NFC chip for super-speedy Apple Pay. Which SIM size does the Apple iPhone SE require? This mobile takes a Nano SIM, which is the smallest type of SIM available. There’s no need to worry however, as you’ll either receive the correct size SIM, or a combination-SIM which snaps down to any required size. What variations of the iPhone SE are available? As well as a range of colours, the iPhone SE also offers a choice of storage capacities, with 16GB and 64GB options available. This is worth bearing in mind if you plan on saving a lot of music, photos, apps and other content. How does the iPhone SE compare to the flagship iPhones? Although scaled down in both size and price, the iPhone SE still has a range of impressive specs that match the iPhone 6S. There’s a 12MP camera, powerful A9 processor, and intuitive 3D touch feature – all of which can be found on the pricier iPhone 6S – but offered here in a more affordable package. Can I purchase this handset SIM-free? No, sorry, at the moment this handset is only available on contract. We do offer a range of SIM-free phones though, if you’d prefer to buy a handset upfront. These can be found here. When was the iPhone SE release date? This handset made its debut in March of 2016. The SE in the name stands for Special Edition, as this handset was released as a budget alternative to the more recent high-cost iPhone models. I followed your advert on line and wondered how good the service would be. Then I noticed that you were the Internet arm of car phone warehouse. That clinched the deal for me. The service was great. Delivery came as promised and absolutely no problems. Device fine &amp; as expected, no issues with it. EE however have been awful with poor coverage &amp; continually failing to send text messages. It's a great phone! So much faster processing, a great size and it's light weight too. I got a great deal and it was quickly delivered. Very happy indeed. Excellent phone and contract deal very happy, will also be getting my husband will be getting his new phone from here once his existing contract is up! Fantastic service and pricing from www.mobiles.co.uk. I will definitely use them again and I have already been recommending them to family and friends. Very efficient and friendly service. Great range of deals that could not be bettered by my previous provider. Will definitely be using mobiles.co.uk again. iPhone SE 64Gb - This thing is pretty damned quick! Battery life is much improved from previous models, screen is nice and bright. Mobiles.co.uk gave a superb deal that even O2 couldn't beat, delivered at the weekend in double quick time. Great phone, loads of memory and a good battery life. Not too large so fits in a pocket easily.